It’s time for another poem from Mom! So I’ll remind you of the introduction to this monthly series and hand the microphone directly to my mother. Enjoy! 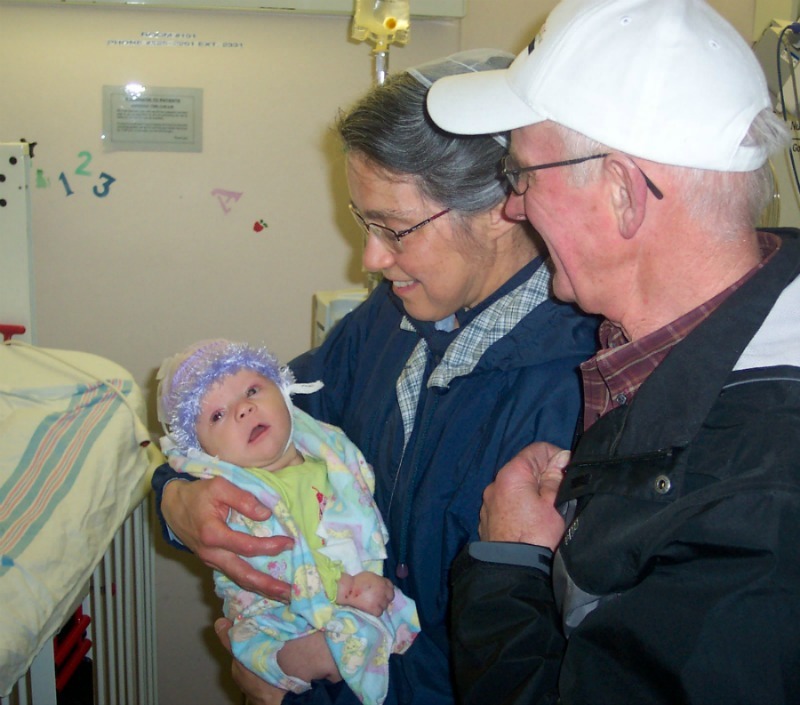 In early 2011 a precious baby girl was born to our son Brent and his wife, Carolyn. Terrifying blood sugar crashes over the next months led to a frightening diagnosis. 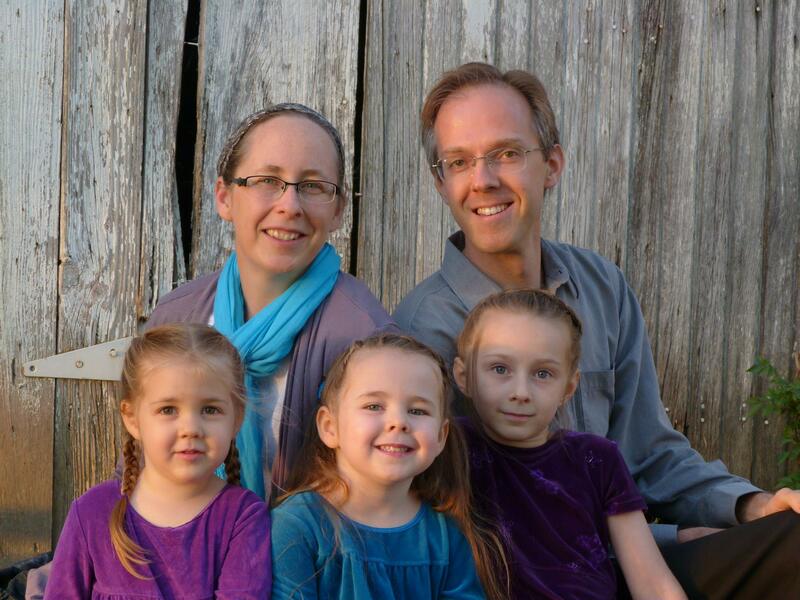 Jasmine had hypopituitarism, an incurable, life-threatening congenital condition. Jasmine with my parents, Ken and Elaine. This poem was born on a woodland walk in early May when I felt a desperate need to hear from God. I tossed my questions to the skies and tramped my fears into the forest floor. At my feet the spring blossoms were bursting through the mulch of years past. Poetry is for me a process of discovery, not a pronouncement of pat answers. In the work of God’s fingers I hear whispers of His ways and glimpse parables of His power. On this morning I again sensed God communing with me in the garden of His creative handiwork. For that perfect and upright man? And open-hearted thanked you for the gift. Each trillium opens pure and perfect to our sight. This cherished child we received with awe? 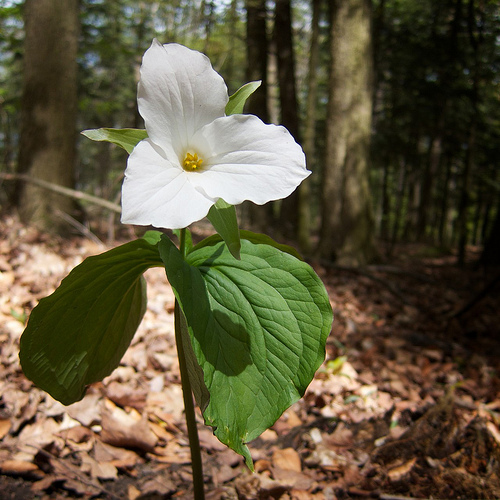 The trillium, Ontario’s provincial flower. Four years have passed since my woodland walk, and our “grand-blossom” is still blooming, exquisite and vibrant, hardy and full of life. Despite heart-stopping 911 calls and anxious hospital stays God has graciously preserved Jasmine’s life. Specialists at Sick Kid’s Hospital, a fine-tuned, carefully scheduled regimen of hormones, funding for the incredibly expensive growth hormone, many miracles, and the constant vigilance of loving parents have been God’s gifts to Jasmine’s health. As with all flowers, we have to learn how to hold such a delicate life in our hands without crushing it, to delight in today with no demands on tomorrow. Must I know God’s purposes before I accept what He sends? Can I joy in the beauty of today and find His grace for any attending pain and for the uncertainty of tomorrow? Jasmine revels in life—in each moment of it. True, she hates needles, but she loves people and runs laughing to meet life, with arms wide open, eyes sparkling and her voice full of laughter. She is learning to cast a line so she can go fishing with her big brothers. She has crammed a lot of living into four years, and her energy and delight seem boundless. As her grandma, I hold each moment with her in a special place in my heart, and I rest in knowing God holds both of us in His. PS: You might also enjoy Mom’s poem about one of Jasmine’s big brothers, my nephew Curtis. I’ve done some study of how music “means,” looking both at music history and at some scientific literature. I’ve concluded that there is some intrinsic emotional meaning to some sounds (for example, sudden, loud or fast sounds tend to increase the excitement level–or, more accurately according to scientific literature, it is unexpected sounds that do this, so an unexpected silence can achieve the same), but that most of the meaning/affective power of music comes from the extrinsic associations we bind up with a particular kind of sound, thanks to our past history and teaching regarding that kind of sound. What we hear and enjoy in our adolescence/youth tends to become the norm by which we experience and compare all other musics we subsequently hear throughout life. I think much fundamentalist/conservative Anabaptist teaching regarding music is a reactionary theology, developed on the “battlefield” in response to the rock and roll music revolution, during which time certain sounds were connected quite closely by a majority of musicians with an evil lifestyle. Those concerns were valid for the time. However, such music today is does not carry those evil associations to a majority of listeners and performers, being innocent enough to be useable for radio jingles and children’s educational songs. The suitability of musical sounds is an important question, yes, but the deeper question is whether the musician is using sound to bless God and neighbor. David used pagan poetic meters to praise Yahweh.